I love interior design. 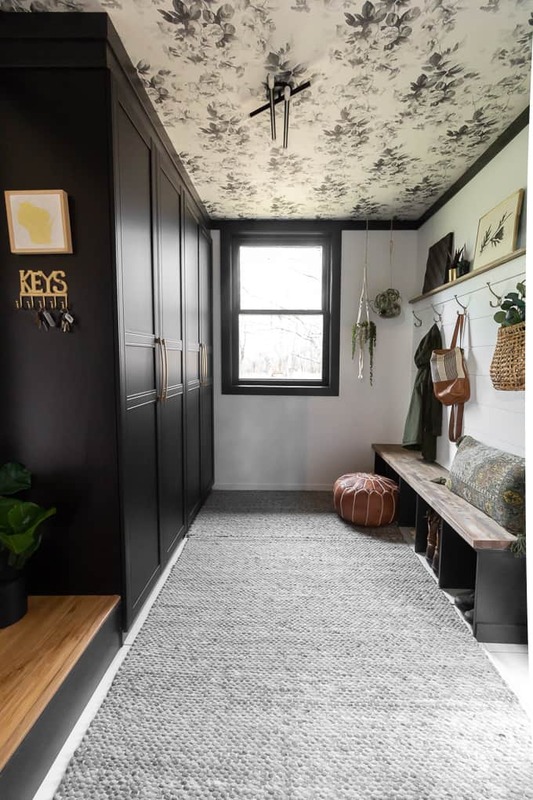 I could spend all day on Pinterest or Instagram, just scrolling around, looking at what design choices people are making and finding inspiration. Does anyone else still read magazines? lol. I used to live in Toronto, which was the hub of all trendy things in Canada. Clothes, home decor, you name it. Now that I live miles away from any metropolitan city centres, I have a deep need to read all the magazines so I can find all of the great new artisans and furniture stores. 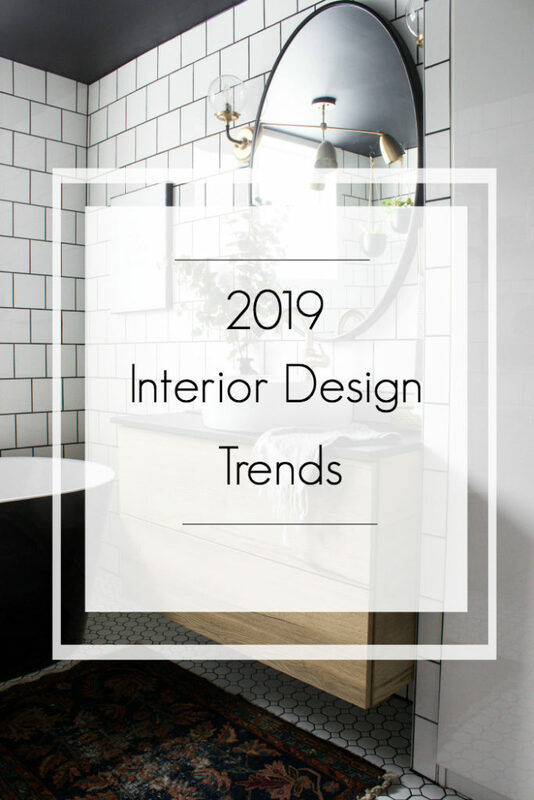 Since I spend all that time deep-diving into what the world is loving, I thought I would share my thoughts on some 2019 Interior Design Trends. 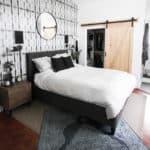 Here are a few of the 2019 interior design trends that I’m seeing come to life. If you love any of the images, please follow the link and pin from the source! Have you seen people taking advantage of that fifth wall yet? I’m predicting that our ceilings start to get a lot more attention. 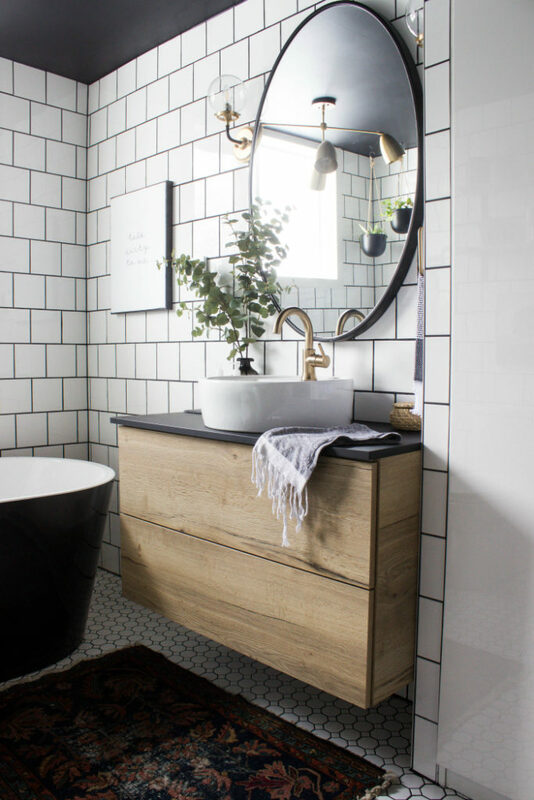 This year I painted the ceiling black in our new bathroom and I loved the impact in made. Jess from My Green Door just wallpapered her ceiling and I’m so in love with it! The feature wall is getting an upgrade. I’m predicting less boring, single painted walls, and more wow factor. Tile and wallpaper climbing up walls, wood features spilling over corners, and brightly painted murals. The accent wall is all about new materials, new designs, and 3D elements. This painted mural by Mandy at Vintage Revivals gave me all heart eyes. Although the traditional 3×6 subway tile will always be classic, I think we’re going to see a lot more variations on subway tile this year. New colours (think pinks and sage greens), new shapes (think squares, and thin long tiles), and new layouts (think vertical long tiles) are on the horizon. There’s a design rumour that terrazzo is going to be the up and coming tile of 2019. I’m not quite sure I’m ready for it’s comeback, or that I’m really seeing that much of it yet, but I’ll be curious to see if it starts getting used more! 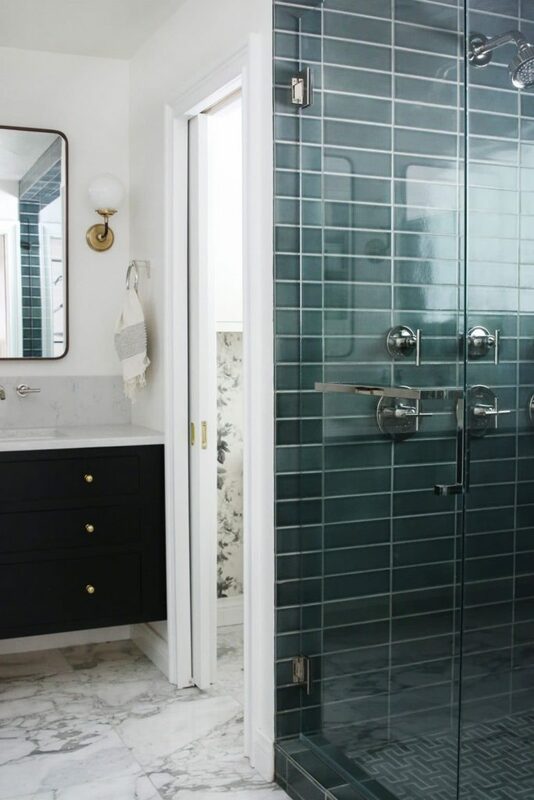 This deep green glass tile that Chris Loves Julia used in their bathroom renovation gives me all the feels. It’s gorgeous! In 2017 I shared my whole home colour palette (& how to find your own!). It was full of rich, moody colours, and it seems like the 2019 interior design trends are finally catching up with me! lol. I’m seeing more and more of those deep greens, dark teals, and even moody purples sneaking into homes. 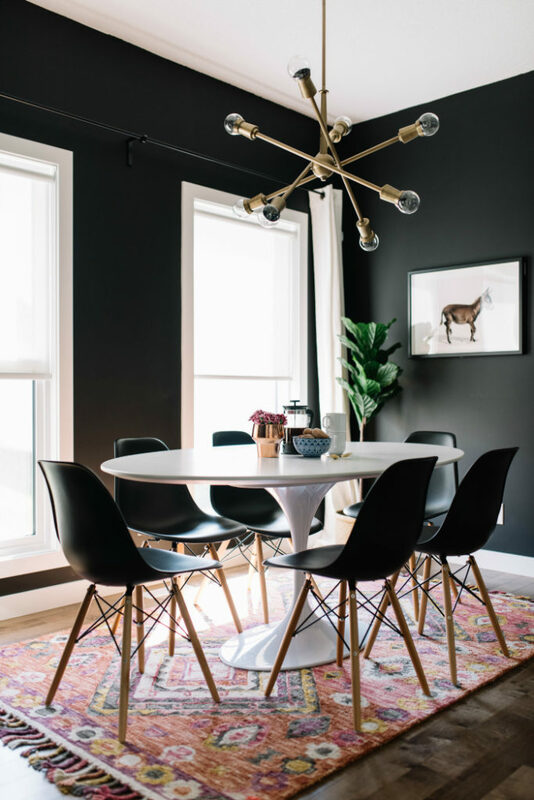 This black walls in the dining room highlight this perfectly moody space. Mixing metals has been on the rise in interior design. There was once a say when you you chose chrome, and stayed with it for your entire bathroom or kitchen or bedroom. 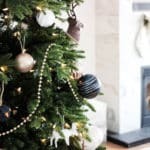 The 2019 interior design trends show that the shift to mixed metals is still going strong, but I think that there will be more emphasis on brass and champagne bronze. Not just in faucets and knobs, but accessories and decor too. The champagne bronze fixtures in our modern bathroom were one of my favourite design decisions in that space! Alright, well… there’s nothing new about florals I guess. But they are being incorporated more and more into modern design. At least more than I’ve ever noticed before. I’m seeing beautiful modern florals in pillows, wallpapers, murals, etc. Busy floral patterns in both subtle (more my style) and bold colourful patterns are everywhere. 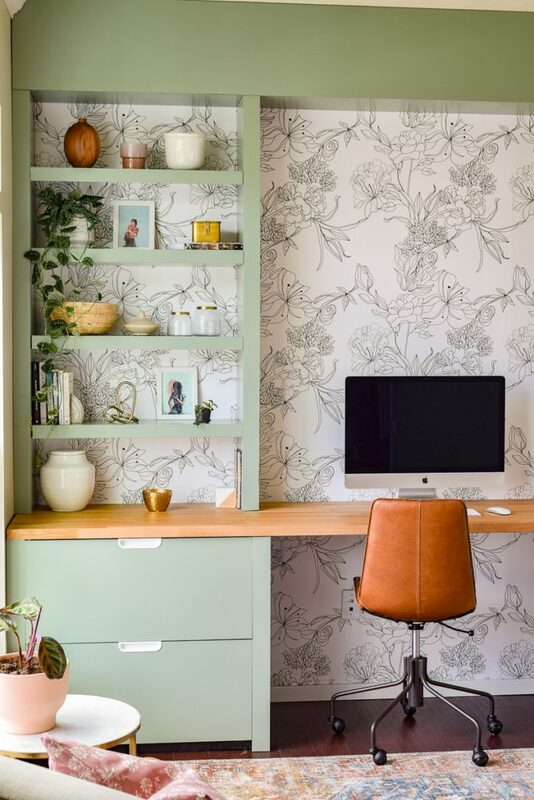 This office from Making Joy and Pretty Things show some beautiful subtle florals that I’m loving! Have you been binge watching the new Marie Kondo show on Netflix? On the show (or in her book) she teaches that if it doesn’t “spark joy” for you, you should thank the items and let them go. Many of us on passing on the things that aren’t sparking joy. 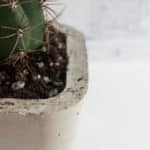 There has a surge towards minimalism for a couple of years now, and I don’t think it’s going anywhere. Where I follow, home tours are looking less cluttered, shelves are styled with less, and paired back aesthetics are speaking volumes in spaces. 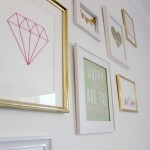 On the other hand, the general trend towards the less-is-more philosophy of decorating is not for everyone. Maximalist style is on the complete other end of the spectrum but also seems to be rising in popularity. Cleverly curated colours, textures and patterns provide so much visual stimulation. 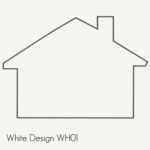 The two styles are at odds with one another and it seems that homeowners and living in the extremes – trending to either end of the spectrum. 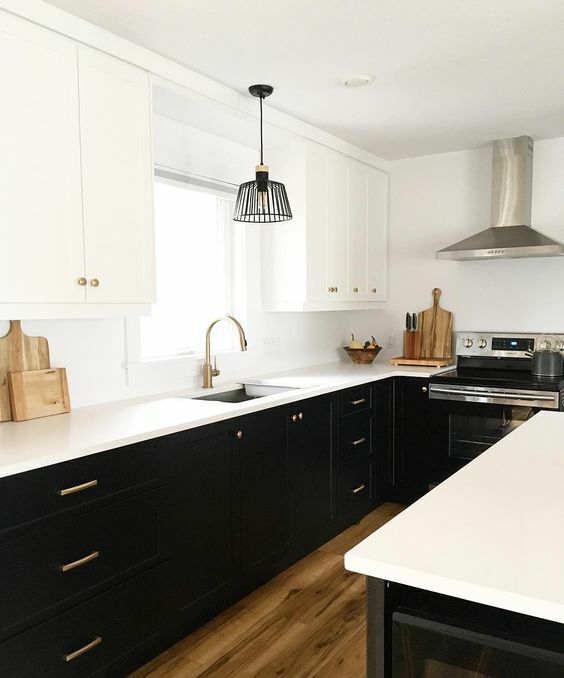 This lovely kitchen is the perfect example personal lean towards minimalism. What do you think of this list? 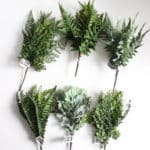 Do you agree with all of the 2019 interior design trends that I mentioned? I’d love to hear your thoughts! This wasnt as scary as I thought! Lol! I love the ceiling idea and now I’m thinking of which one I could give some extra love to!!! 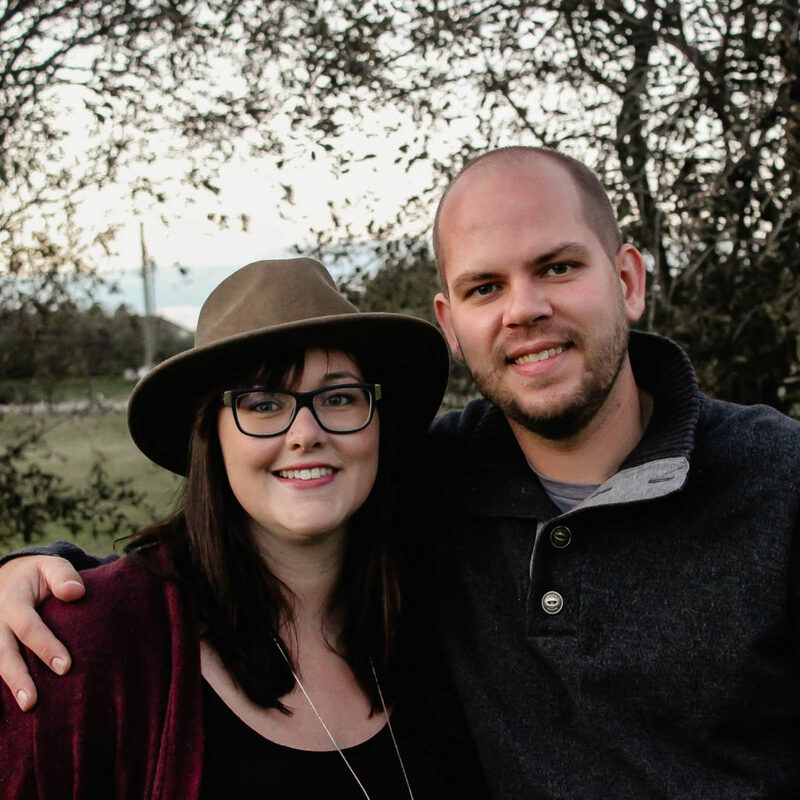 Thx for sharing these, Lindi! Hope you’re staying warm! I love the first one, painting the ceiling. Gotta add this to my list this year. Thank you for sharing!